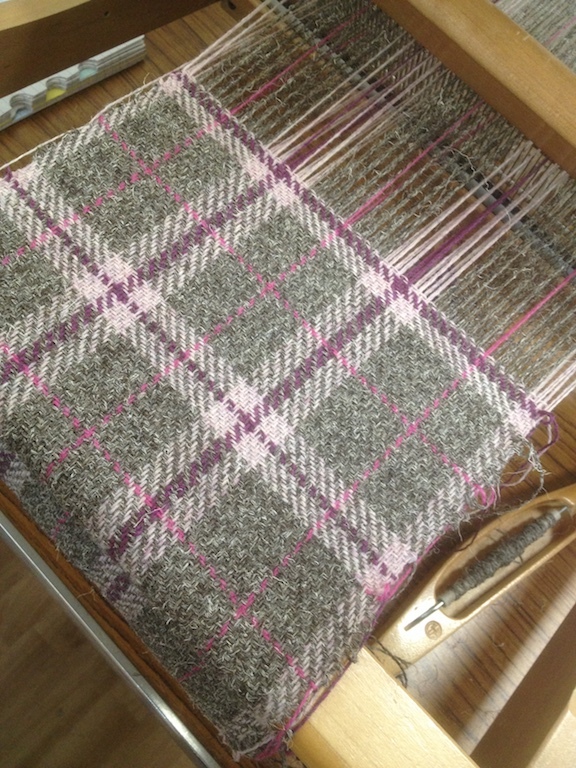 Higham Hall | Tartan from Herdwick Yarn! Higham Musings / Tartan from Herdwick Yarn! Two students (who came down from Skye, you know who you are – I won’t embarass you… yet! Mind you, devoted readers might put two and two together and work out exactly who you are) who attended Jan Beadle’s tabletop Loom Weaving course this week, brought with them some yarn spun from their own Herdwick sheep (presumably they’d got a sheep-sitter in whilst they were here!). The resultant tartan fabric they created was delightful, and had, as you would expect, the characteristic ‘Herdiness” about it. The colour tones as well were very pleasing and the speckled nature of the wool from our native cumbrian sheep is unmistakably showing through in the picture. Tartan, of course, is such a pleasing pattern, with a well-known heritage and Tutor Jan thought it might make a good title for a course. It did, indeed, and the course was full with 8 people. We intend to run it again next year, but not before Jan has been twice more to share her inspirational skills with different weaving themes.